This beautiful and stylish Vintage Solid Women Genuine Leather Backpack is made of high-quality Genuine Leather and processed with oil wax, so it looks brighter and acquires water and oil-proof functionality. You can carry all your daily essentials in this fashionable backpack as it is quite spacious and has plenty of room. You can put quite a few books, other necessities, a small tablet, and a wallet, and other little things such as keys. 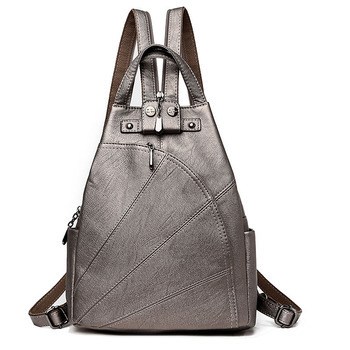 This leather backpack is suitable for daily-use, such as shopping. dating, working, traveling and so on. Recommend. Quality goods, very fast delivery. All super. Packed well. All seams are smooth, reliable locks, color like the photo. Came quickly. The package came quickly, for three weeks, at exactly the appointed time. The backpack: Happy that it has a lot of pockets, but the backpack is more like five centimeters wide. In general, am happy, I recommend. Decent Backpack! When I received the parcel I thought that it was small. It is very compact but surprisingly roomy. Photo and description are consistent. No bad odors. Sewing quality is very good. Fully satisfied with the purchase. In a lot of independent pockets detail. The fact that it has two main sections, each with its own zipper, which means that you do not need to open the whole pack simultaneously, only right department. Buy recommended! The backpack itself is very good. The color matched, there is a slight smell inside, but I think it's no problem, it will go away. All in all, I would recommend. Very happy with purchase. Fully compliant with backpack description. Genuine leather, high quality sewing. Light smell right after unpacking, has now grown weaker. Store sent a complimentary gift. Will recommend this store. Goods quality matched the description, package size small, it seems bigger the description picture, slight smell, not very obvious. 5-day delivery. It finally came today. Fully compliant with item description, looks very cool, but it seems smaller in reality. Quality, there is a little smell, need to be ventilated. In general, satisfied purchase. Matched the backpack pictures. Quality sewing. The backpack is cool! high quality.